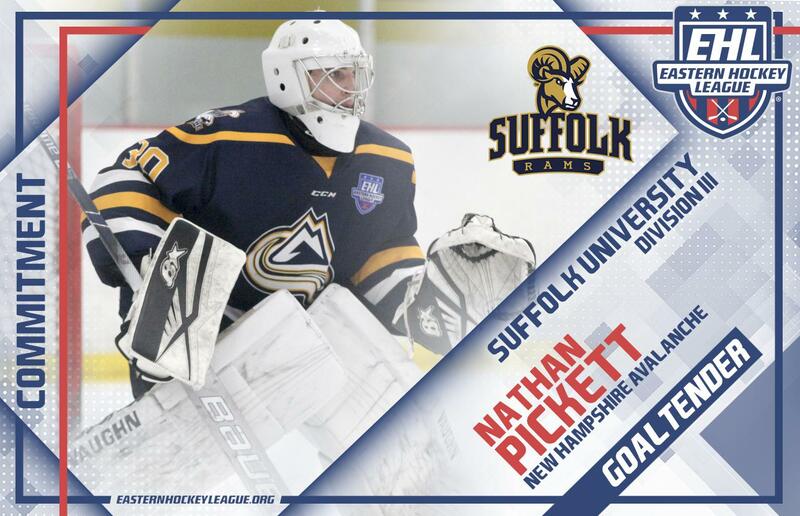 HOOKSETT, NH -- Nathan Pickett, a goaltender for the New Hampshire Avalanche, has committed to Suffolk University for the fall of 2019. The '99 native of Auburn, MA is enjoying his first season of junior hockey in the Eastern Hockey League (EHL), as he currently owns a record of 20-1-0 to go along with a 1.73 GAA, a .940 save percentage, and three shutouts. "Pickett was a great early addition to our team," said Avalanche head coach and general manager Chris Cerrella. "He has come in and earned everything he has received this season. I think he is going to be great at the college level. He moves very well in the crease and is very calm; he gives you a chance to win every night. I think he is a great addition to the Rams hockey program and a great addition to Suffolk University's strong academic community. I am happy to see Pickett go to college exactly where he wanted to, and I wish him and his family nothing but the best of luck." As Cerrella mentioned, Pickett found the perfect fit for himself both from the academic and athletic perspectives. The netminder is the first EHL player to commit to the Rams this season, and 14th player to do so since the league was formed back in the 2013. Overall, Pickett is beyond grateful to have reached this moment in his career. "I would like to thank my family, especially my mother, who has always supported me," said Pickett. "I know my father would be very proud of my decision to attend Suffolk University, both on the ice and in the classroom. I also would like to thank Coach Cerrella and the entire New Hampshire Avalanche organization for bringing me into part of their culture of success to help me grow and get better." To no surprise, Pickett has earned a number of accolades throughout his spectacular season with the Avalanche. Last night, he added to his 'Goalie of the Year' resume, as he anchored his team to an overtime victory against the Boston Jr. Rangers. With the win, the Avalanche clinched the North Division of the New England Conference, and earned themselves a First Round bye in the EHL Playoffs.